I am taking the day off to play. I have way too many UFO’s that need attention. I can’t think of 10 off the top of my head, so I hope to make some headway into a few of them today. Here is one I started in August after a yarn sale. It is in some kind of lace weight, hand dyed, mohair and silk yarn. 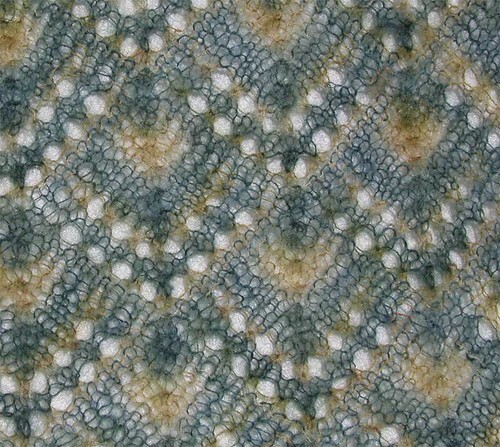 I am using the domino lace technique and trying to get each square similar using 5 different skeins. I am a little over halfway so I do need to keep going. It will be a nice shawl for next year. This entry was posted on Friday, February 27th, 2009 at 3:00 am and is filed under Knitting and Lace. Tagged: Knitting, Lace. You can feed this entry. You can leave a response, or trackback from your own site. Have a great day off playing! I love taking a day off to do that! That will be pretty when done!